Thickening Fat: Fat Bodies, Intersectionality and Social Justice, seeks to explore the multiple, variable, and embodied experiences of fat oppression and fat activisms. 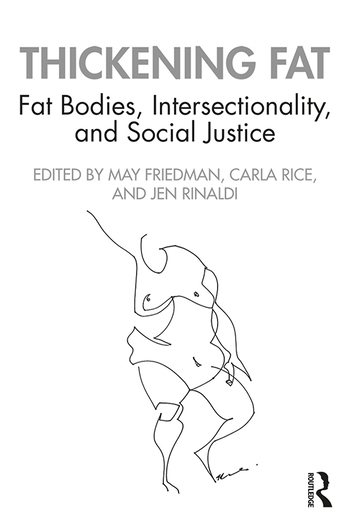 Moving beyond an analysis of fat oppression as singular, this book will aim to unpack the volatility of fat—the mutability of fat embodiments as they correlate with other embodied subjectivities, and the threshold where fat begins to be reviled, celebrated, or amended. In addition, Thickening Fat explores the full range of intersectional and liminal analyses that push beyond the simple addition of two or more subjectivities, looking instead at the complex alchemy of layered and unstable markers of difference and privilege. Cognizant that the concept of intersectionality has been filled out in a plurality of ways, Thickening Fat poses critical questions around how to render analysis of fatness intersectional and to thicken up intersectionality, where intersectionality is attenuated to the shifting and composite and material dimensions to identity, rather than reduced to an "add difference and stir" approach. The essays in this collection ask what happens when we operationalize intersectionality in fat scholarship and politics, and we position difference at the centre and start of inquiry. May Friedman is an associate professor in the Ryerson University School of Social Work and Ryerson/York graduate program in Communication and Culture, and she holds a Ph.D. in Women's Studies from York University. Dr. Friedman has a long publication history including the award-winning monograph Mommyblogs and the Changing Face of Motherhood, 2013 as well as five edited collections. Jen Rinaldi is an assistant professor in the Legal Studies program at the University of Ontario Institute of Technology. She earned a Doctoral degree in Critical Disability Studies at York University, and a Master’s degree in Philosophy at the University of Guelph. She is the President of the Canadian Disability Studies Association. Carla Rice is Professor and Canada Research Chair specializing in embodiment/subjectivity studies and in arts-based/research creation methodologies at the University of Guelph, and she holds a Ph.D. from York University and a Masters of Education from the University of Toronto. She founded Re•Vision: The Centre for Art and Social Justice as a leading-edge arts-informed research centre with a mandate to foster inclusive communities, well-being, equity, and justice. She has received numerous awards for advocacy, research, and mentorship including the Feminist Mentorship Award and the Mary McEwen Award for Outstanding Gender Studies Scholarship, and she was recently inducted into the Royal Society of Canada. She has published numerous books and articles and directs multiple research grants.